You heard it here first: Green is the new black. Environmentalism is a hot topic and everybody is jumping on board and doing their part to reduce waste, re-use, and recycle. Fashionably, of course. And in that spirit, and the spirit of obtaining a stack of new outfits for free, you can spend an afternoon or evening doing good and looking fabulous by hosting a clothing swap. 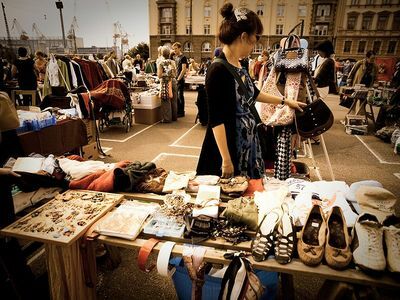 A clothing swap is an event wherein fashionable and environmentally-conscious individuals gather all of their unwanted clothes and accessories, truck them along to a venue, and trade to their heart's content. Many businesses or charities offer organised clothing swaps, but it can be a lot of fun to host your own among friends. First, decide who you would like to invite. If you're holding the swap in your home (and don't live in a mansion or a shoebox), a small group of about 8 to 12 people will provide you with enough variety and sizes to satisfy everybody, without requiring too much preparation. It's a good idea to chat to everybody and choose a date and time when most people are free before you set the specifics, as there is much less fun to be had when you only have your sister's old clothes to choose from. Particularly if they were yours before she got them. Choose a room in your house large enough to accommodate everybody, as well as their clothing. You might agree on a number of items for each person to bring, if your space is limited. Allocate a nearby room to act as a change room and ensure it has a large mirror in it and good lighting. If you have access to a sewing machine, you could set it out to allow people to make quick alterations or daring re-designs. You will also need somewhere to put out some delicious treats and something to sip. Invite your guests to bring any clothing or accessories they no longer want. When they arrive, collect everybody's clothing. It works well when everybody pitches in at the setting up stage, as people get their first look at the items and start to form an idea of what they like. You can set up the items in groups around the room, for example shoes, bags and belts in one corner, dresses hung from the curtain rod, and so forth. You might pass around an item until somebody likes it, take turns choosing, or throw everything in a heap and have a good rummage. If you prefer a more orderly approach, have people trade their items at the door for some form of currency, then use the currency to buy items from the collection. This is common in professional clothing swaps, and often buttons work well. You could also put on a fashion show or vote for the craziest, funniest or most popular outfit. Other options for a clothing swap might include a mothers only clothing swap, whereby mums bring their own garments and their childrens' to swap. You can hold several swap parties with different groups of friends, from work, school or organised sports. Think of the possibilities for your wardrobe! Charity begins at home, so when arranging your swap party, go the extra step by agreeing with your friends on an entry charge, to be donated to your favourite charity or conservation group. You can also donate any clothing that nobody wants to a local op shop, where it can be re-loved by somebody else whose money will fund a good cause. In return, you've gotten a new wardrobe and lots of warm, fuzzy feelings. Why? Because recycling doesn't need to be boring. When: Best for afternoon or evening. Where: Your house or mine? These things can be great if everyone is on the right page and bringing good quality items with the right attitude.